The finishing line of the Olympic marathon is marked on the piazza of this BBC site, just outside where the "One Show" studios used to be, until December 2013. This is the site of BBC Television Centre, built in the late 1950's. A small section of tiled flooring from the White City Exhibition (shown in this photo) still exists in the audience queuing area outside studio TC1. Let's hope it survives the current redevelopment of this site. This was Jack Petersen's eighth British Heavyweight title fight and he was the defending British Heavyweight champ. The fight was against Jack Doyle, a young boxer from County Cork and it was mired in controversy. 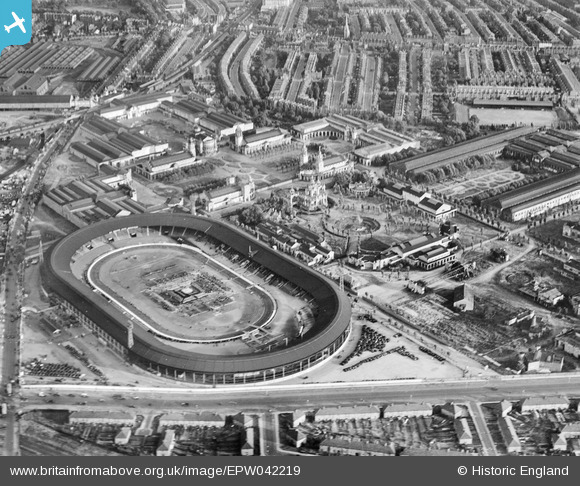 The bout, in July 1933, was held at the White City Stadium in front of a crowd of about 30,000 but estimates of the crowd go as high as 60,000. It lasted less than two rounds as Doyle was disqualified for repeatedly punching low (three quick punches in succession). Doyle was subsequently suspended for six months by the Control Board and his purse of £5,000 was withheld. The date of the fight was July 12th 1933 which also handily confirms the date the photos were taken. Amazing to see the White City exhibition buildings. I believe at this time (1933) it was seeing out its last few exhibition centre years as a venue for textile fairs. Then used during WWII for parachute manufacture before part of the site was redeveloped as the BBC Television Centre.